ALiEn2 v2.0.0 available with support for Surface Velocity optimization - Extreme Telematics Corp. 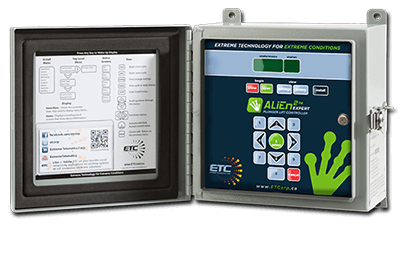 Extreme Telematics Corp., experts in advanced technology for the oilfield, is proud to present a new firmware release for ETC plunger lift controllers. Version 2.0.0 can be downloaded and installed quickly and easily using ETC Vision Device Management Software and features exciting advancements to enable surface velocity optimization with the Sasquatch plunger velocity sensor. Display Surface Velocity in status screen Quick & easy viewing of the Surface Velocity of the last plunger arrival. If you witness a fast arrival while on site you can quickly check the Surface Velocity. Fast Trip and Danger Trip using Surface Velocity Automatically shut in your well when the plunger is travelling too fast at surface. Optimization using Surface Velocity Real-time Surface Velocity provides the most accurate information for optimizing production. Adjust open and close times for plungers arriving too fast or slow. Modbus over TCP Server added to simulator Allows for faster and easier SCADA integration. In addition to these new features, our patent-pending velocity optimization algorithm, which makes adjustments that are proportional to the current flow/close time, is now the default optimization method. This Current Time Velocity Optimization was used with average plunger velocity to double production in a recent case study. To learn more about the benefits of using Surface Velocity to optimize your plunger lift wells, please visit www.plungervelocity.com. To download a simulator of our ALiEn2 plunger lift controller, click here. Check back later for a link to the official press release!